Cabbage is a vegetable with mainly three varieties in Italy: white cabbage (cavolo cappuccio), Savoy cabbage (cavolo verza), and black cabbage / Tuscan cabbage (cavolo nero). Cabbage is rich in Vitamin C and minerals but loses some of its nutritional content when cooked. Buy: Look for cabbage which feels solid and heavy for its size and has tight, crisp, blemish-free leaves. The cabbage should not appear puffy, have a split end, be dry, slimy, or woody. 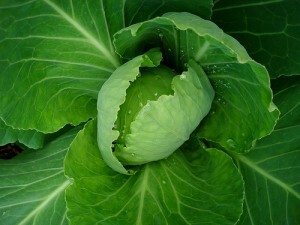 The heart of the cabbage should be compact, unless they are spring cabbages and have not developed a heart yet. 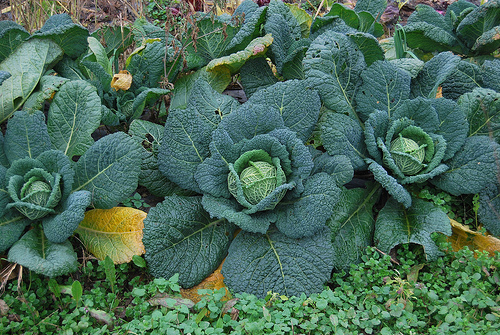 Summer cabbages may have leaves which are more open than the winter varieties. It is best to buy whole heads of cabbage as they begin to lose their nutritional value once cut. Store: Cabbage can be kept for weeks in the refrigerator but the nutritive values degrade rapidly. It is best to keep it for 1 to 2 days (particularly once cut) wrapped in the refrigerator drawer. Prepare: Cut the cabbage into quarters and discard the tough, blemished, outer leaves. Cut out the hard heart and discard. Do not overcook cabbage or it will become sulphurous. The briefer the cooking time the better. Eat: Cabbage pairs best with olive oil, butter, Parmigiano-Reggiano cheese, horseradish, mustard, marjoram, sage, apples, lemon, potatoes, and buckwheat. 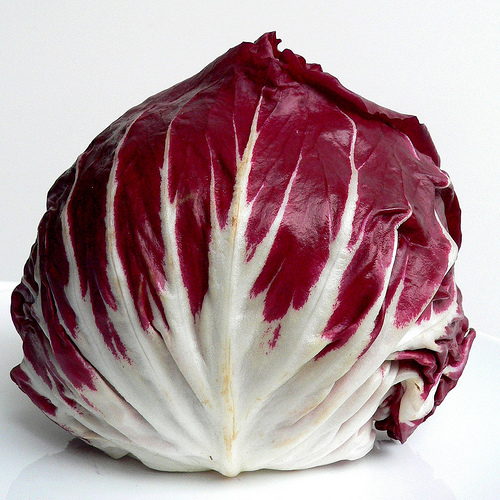 Buy: White cabbage can actually be green, white, or red in colour. 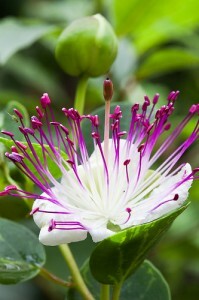 It has smooth leaves which are tightly packed around a large heart. White cabbage can be round or conical (summer varieties). The leaves are crunchy but become tender when cooked. Prepare: White cabbages have tightly wrapped leaves which rip when separated so it is best to cut in quarters, discard the outer leaves, cut into strips, and then wash the leaves. Cut out the hard heart and discard. Red varieties should be cut with a stainless steel knife or will turn blue and they take longer to cook than the green varieties. Eat: The red coloured varieties of white cabbage lose their colour when cooked unless a bit of vinegar is added when cooking. 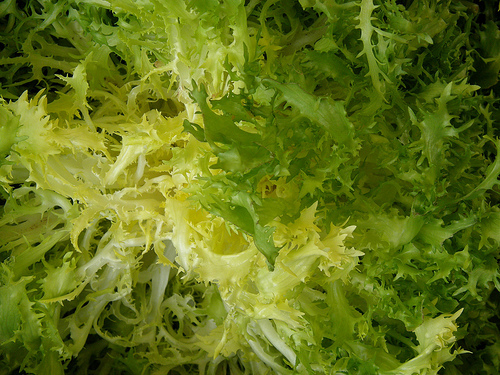 White cabbage can be eaten raw in salads (ancioada) or cooked. It is stuffed (gaggette pinn-e), preserved (crauti), steamed, braised, stewed (verze soffegae), sautéed (capuzi in tecia and cappucci e cicorie), or boiled (cavolo rosso stufato, pecora e cavoli, and piedini di maiale con cavolo). Cabbage is used in soups (tognaque), pastas, rice dishes, and is served on its own as a side dish. 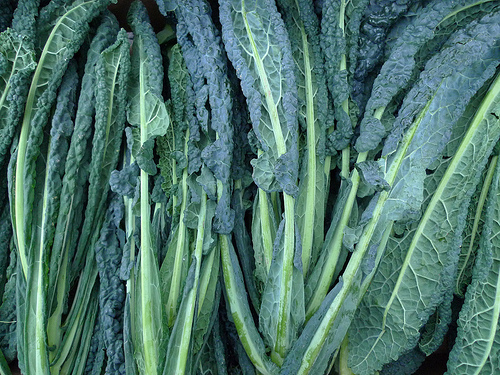 Buy: Savoy is a green cabbage with loosely-packed, bumpy leaves primarily found in northern Italy. Some varieties have a shade of blue to them. 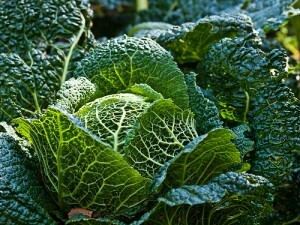 Savoy cabbage is more prized than white cabbage as it has a delicate flavour and is tender thus requiring less cooking. Frozen cabbages (verze gelate) which have frozen outer leaves and a tender heart are considered a delicacy. Smaller varieties such as the Precocissimo d’Asti are harvested in the summer while the larger varieties such as Tardivo di Milano and Testa di ferro are harvested in the autumn and winter. Prepare: Savoy cabbage is easier to separate the leaves so you can discard the outer leaves, then pull off the individual leaves, and discard the hard heart. Wash the individual leaves and then cut as per the recipe. Eat: It is cooked primarily in soups (minestrone, riso e vere, zuppa di cavoli alla canavesana, and seupa vapellenentze), stews (casoeûla, coda di valdostana, and castagne e verze), is stuffed (caponet, valigini, and involtini di verza), is served as a side dish (verze offegae, pipeto, and verze imbricate) , or can be cooked with goose (such as oca con le verze), sausages (such as verze e luganega), or tripe (such as trippa con le verze). It can be steamed, braised, or sautéed. Buy: Black cabbage has long, dark green, bumpy leaves with curly tips and no heart. 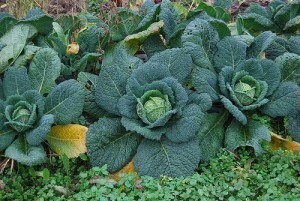 Black cabbage is harvested in the autumn and winter and is most popular in central Italy. Prepare: Pull the leaves away from the base, discarding any damaged leaves. Discard the heart and wash the leaves. Prepare the leaves as per the recipe. 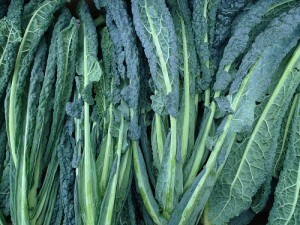 Eat: Black cabbage is best in soups (ribollita, zuppa frantoiana, bordatino, and riso e cavolo sul lampredotto), with polenta (arbada and farinata con le leghe), sautéed, boiled, steamed, and stewed (feta col cavolo nero). Capers are the flowering buds of a plant that grows wild on the coast in Italy. It is one of the most ancient of flavourings in the Mediterranean. 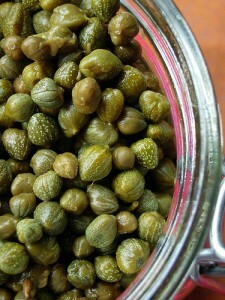 Buy: The best capers are the small ones as they have the most intense flavour. Capers are sold in vinegar, salted, or brined. The best are said to come from the island of Pantelleria in Sicilia. Buy capers which have been salted over those in vinegar (as they are more like a pickle) and brined. Store: Store in a cool, dry cupboard. Prepare: If you are using capers soaked in vinegar or brine, then rinse them in cold water, dry, and then use. If you are using salted capers then soak them in cold water for a few minutes, rinse with cold water, dry, and use. Capers are used as a flavouring. 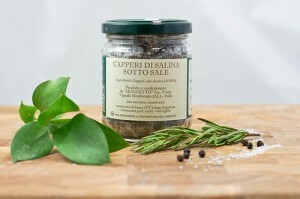 Unless the capers are freshly salted (still appear plump and not desiccated), they should be added to dishes at the end of cooking so they don’t lose their flavour and develop a bitter taste. Eat: Capers are eaten in pasta dishes (spaghetti alla puttanesca), pizza, sauces (salsa verde), and with seafood and lamb. 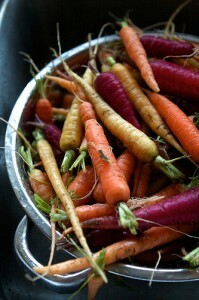 Carrots are a very old vegetable, eaten in Europe for almost 2,000 years. They are a root vegetable that grow long to a point although there are round ball shaped varieties. Carrots are typically orange but can be red, white, purple, or yellow. 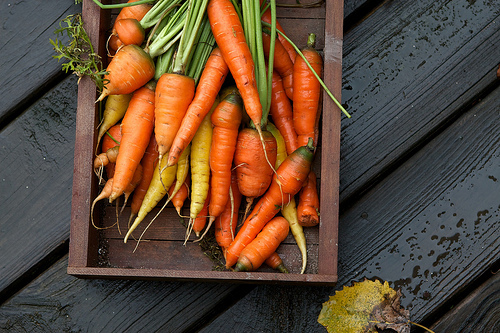 Different varieties of carrots are in season in different times of the year but carrots are harvested year-round. They are a good source of calcium, phosphorus, magnesium, potassium, sodium, and Vitamin A (carotene converts to vitamin A). Carrots are used to treat dermatitis and make cosmetic products. Buy: Carrots can be cylindrical or conical in shape. It should be straight with a single point and free from wrinkles, black marks, holes, or soft spots. It is best to buy carrots with the greens still attached so you can see how fresh they are. In any case they should be slender (no more than 3 to 4 cm in diameter), hard, not withered, without black marks or any evidence of additional roots trying to grow from them. The more slender the carrot, the less likely to have a large central core which is woody in texture. Cracks in the carrot will also indicate a woody core. The length of the carrot is determined by the age and variety. Long carrots can be up to 30cm, medium-long carrots are 8 to 15cm, and short carrots are 4 to 7cm in length. The more intense the colour, the better the flavour. Carrots can also be sold frozen or preserved in vinegar. Store: If you bought carrots with the leaves attached then cut the leaves and discard as they will drain the root to stay fresh. You can keep the carrots wrapped in the refrigerator for 2 weeks. Do not store carrots together with apples and pears or else the carrots will deteriorate more quickly. Prepare: If the carrots are very small, then they need only be washed. Larger carrots should be washed, peeled, and the ends removed. If the carrots are very large then the centre woody part should be removed. Cut according to the recipe. Eat: Carrots can be eaten raw or cooked. Tender young carrots only need about 7 minutes to cook. Carrot, celery, and onion finely diced are combined with some other ingredients and are called battuto or soffrito (depending on the mixture) and often form the base for many Italian dishes, particularly soups, stews, marinades, and boiled, stewed, and braised meats. Carrots are a necessary ingredient in broth, salads, and pinzimonio. Carrots are cut into rounds, julienne, batons, or puréed. They can be boiled (in bollito misto), steamed, roasted, marinated, sautéed, or stewed and are a good accompaniment to white meat and fish. A little grated carrot can be added to a tomato sauce if it is too acidic. Carrots can also be used in moulds, pies, and cakes (torta di carote). Carrots pair well with butter, olive oil, mint, chilli, mustard, and honey. Celery is a vegetable which grows in long concentric rounded stalks around a base with green leaves at the top. The leaves and the root can also be eaten. It is in season all year-round. Celery is rich in calcium, phosphorus, potassium, sodium, and vitamin A. Varieties include: Verde a canna pienna which is large, Bianco Pieno which is medium sized, Pieno Pascal, d’Elna verde, and Dorato d’Asti. Buy: Celery has a strong flavour. 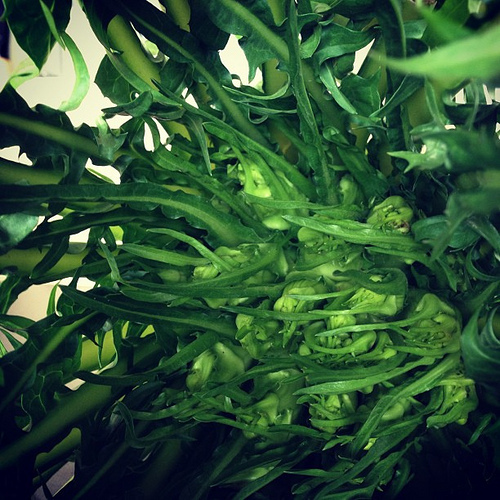 The celery stalks should be crunchy, firm, and fresh and be light green or whitish. Dark green stalks will be stringier. The leaves should look fresh, the centre more light coloured, unblemished, and not withered. Celery should have no brown spots and the top of the celery where it has been cut will indicate how long the celery has been sitting around. Don’t buy celery with withered brown tops. The stalks should be straight, compact, and well-trimmed. White celery is deprived of light when grown to make it more tender, crunchy, and sweet. It can also have a yellow or pink hue. Store: Celery should be wrapped in plastic and kept in the refrigerator for up to a week. Do not let the celery get too cold or it will get damaged. If the celery has started to go limp, you can cut the base, wrap it in moistened paper, and soak the end in water. Limp celery can still be used in stock. Prepare: Remove the ribs you need from the base, discarding any damaged ones. Wash the celery well. If you are using the celery to feed children or in a salad, snap one end and pull down to remove the string. Cut both ends off and cut the celery as required for the recipe. Celery leaves can be used in salad. Do not use celery leaves in making stock or soup as the liquid will turn dark, cloudy and bitter. Eat: White celery is typically eaten raw in salad, with cheese, on its own, in pinzimonio or with bagna cauda. Green celery is typically braised, fried, or blanched. Celery, carrot, and onion finely diced are combined with some other ingredients and are called battuto or soffrito (depending on the mixture) and often form the base for many Italian dishes, particularly soups. 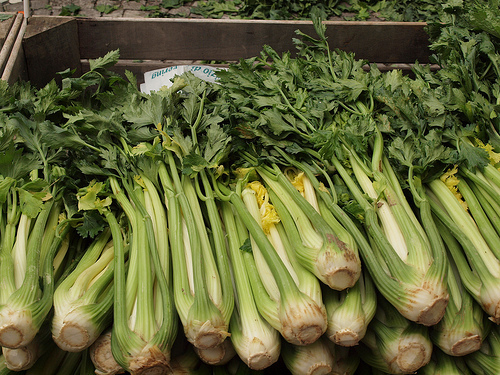 Celery is typically cooked but may also be used in pinzimonio. It can be an accompaniment to red meat. Chard is a leafy vegetable which can have white, yellow, or red ribs with green leaves. 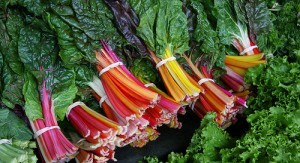 Chard can be grown for its ribs or its leaves (erbetta) depending on the variety. It is in season from May until November. There is also wild chard (bietola selvatica/bietolina) which has very small ribs. 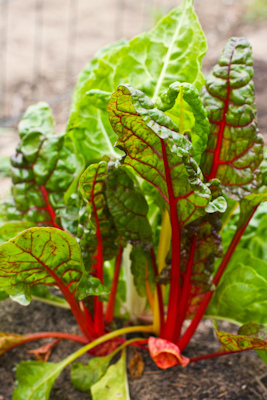 Chard is rich in Vitamin A, calcium, and phosphorus. It also has some iron. 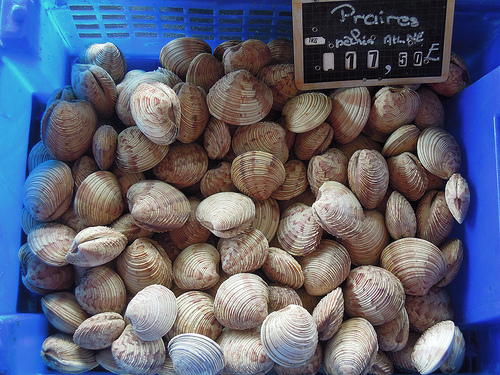 Varieties include Vere a costa larga argentata which have large ribs and Bionda di Lione. 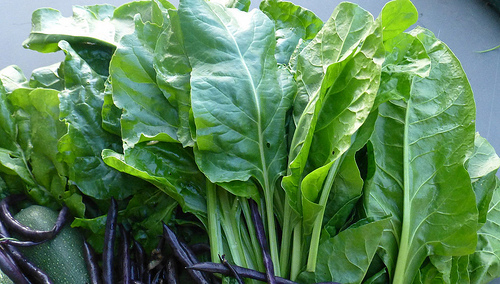 Buy: Chard should have bright green leaves and clean smooth ribs free from holes, brown or yellow marks, and wilting. Chard may have large or small leaves. Smaller leaves will always be tender and cook quickly. 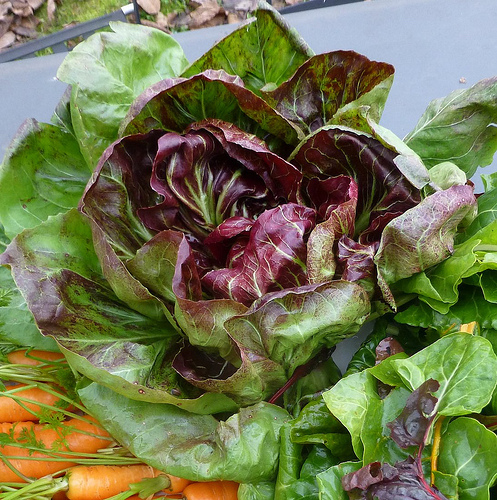 Store: Chard is best eaten fresh so that the vitamins are optimal. Otherwise, place in a plastic bag in the bottom of the refrigerator at 5 to 6˚C for a couple of days. Prepare: Wash well in several changes of cold water and dry thoroughly and cut off the ends. 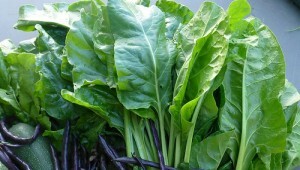 If the chard leaves are small and the ribs are tender then they may be cooked together. Otherwise the ribs need to be cut out of the leaf. If the ribs are very fibrous then the fibers need to be pulled out by snapping the end off and pulling down along the rib to remove the strings. Cut ends and strings can be used in making vegetable stock. The ribs can then be chopped and boiled or braised separately from the leaves as their cooking time is longer. The red variety may stain red the other food is cooked with. Eat: Chard may be eaten raw or cooked. I much prefer it cooked. The leaves are typically boiled and dressed, sautéed, steamed, braised, baked, or added to soups, stews, stuffed pastas, and savoury pies (erbazzone). Chard pairs well with olive oil, butter, saffron, garlic, chilli, lemon, vinegar, tomatoes, potatoes, chickpeas, pasta, and eggs. There are hundreds of cheeses in Italy. Cheese has been produced in Italy since ancient times and from the 5th Century, Sicilia has been well-known for its cheeses. Cheese-making technology: uncooked (curd cut but not cooked), semi-cooked (curd cut and cooked at less than 48˚C), cooked (curd cut and cooked at 48 to 56˚C), stretched curd (curd ripens in acid whey for a few hours and stretched by hand), pressed curd (pressure placed on cheese for 1 to 24 hours to remove whey), blue or veined (blue or green mould formed in veins either naturally or having been introduced), bloomy rind (white microflora induced mould forms on the rind), and washed rind (outer rind washed with brine or water and alcohol, particularly used for soft cheeses). Store: Cheese will continue to mature after you take it home. Fresh cheeses should be eaten as soon as purchased as they were not meant to mature and will spoil. Cheese should be wrapped individually in parchment paper and then in tin foil so that the cheese can breathe and placed in the drawer of the refrigerator. Do not commingle cheeses in the same packaging or they will affect the flavour of each other and will transfer mould. Prepare: Remove the cheese half an hour before serving, unwrap it and allow it to breathe before serving. If hard cheeses develop mould, you can simply cut the mould off and continue using. If fresh cheeses such as Mascarpone develop mould, they should be discarded. For Ricotta, check the Ricotta section below. Eat: In creating a cheese platter, it is best to not buy fresh cheeses or flavoured cheeses unless it is a particularly special cheese. Normally there are an odd number of cheeses, typically 5 different kinds and should include a mix of hard and soft and have about 2 ewe’s milk cheeses, 1 goat’s milk cheese, and 2 cow’s milk cheeses (including one blue cheese such as Gorgonzola). They are normally placed from the mildest flavoured cheese to the strongest flavoured cheese (this would be the blue cheese). Cut the cheese cut into wedges or rectangular blocks. For hard cheeses, remove the rind on the top and bottom starting from the centre of the cheese and cutting down to the end. The cheese board can be accompanied by honey, grape must, walnuts, pear, or grapes. Each cheese should ideally have its own knife so that they flavours are not intermixed. Caprino is a cheese which is made in whole or in part with goat’s milk but can also mean a fresh cheese which is cylindrical in shape. Caprino made entirely with goat’s milk are made in the Valle d’Aosta, Piemonte (Cuneo), Lombardia (Barzio, Introbio, and Valsassina), Liguria (Valle dell’Arroscia), and Sardegna. Caprino made with mixed cow and goat milk is made in Abruzzo (around Rivisondoli) and Calabria. 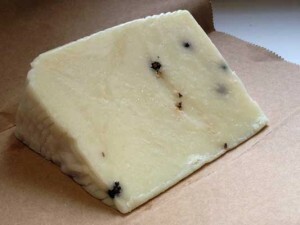 Buy: Caprino can be sold fresh or mature and can be firm or soft. It can be stored in aromatised oil with garlic, bay leaf, and / or chilli. Prepare: If the cheese was sold with a mouldy white or grey rind, then is fine to keep attached. Eat: Caprino can be eaten with oil and pepper or with herbs. It can be eaten as a table cheese or used in recipes. Grana Padano is from Lombardia and has a designated origin, produced in 27 provinces along the Po Valley. It is produced in Lombardia, Emilia-Romagna, Piemonte, Trentino, and Veneto regions. This is another type of Parmigiano-Reggiano, also a hard cow’s milk cheese, but it is not held as highly in esteem. Buy: The hard, thick, smooth dark yellow or gold coloured rind of the cheese should have the mark “Grana Padano” with the date of production and the number of the dairy imprinted on it. 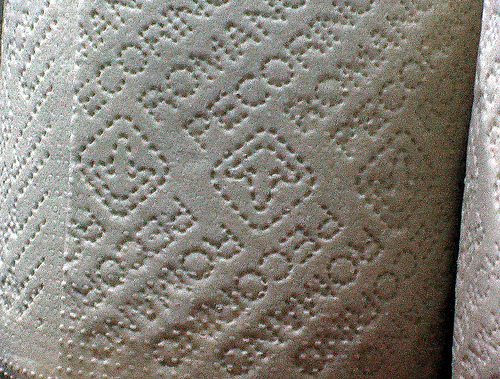 Grana Padano from Trento may have a further designation of “Trentingrana” imprinted on it. The cheese should be dry, hard, finely granular and have a golden yellow colour to it. 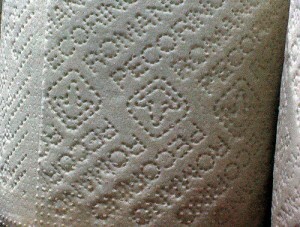 It should break up in flakes when cut. It is made of partially-skimmed raw cow’s milk cheese. 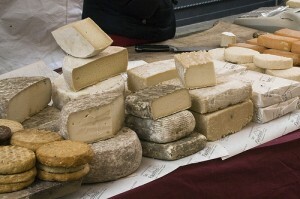 The cheese can be matured over 12 to 36 months. Prepare: Remove the cheese half an hour before serving, unwrap it and allow it to breathe before serving. If there are any mouldy parts, cut them off and discard. Use the rest of the cheese as normal. Eat: It is not used in cooking but used as a table cheese to eat as is or as a topping for pastas and risottos. A type of fresh cow’s milk cream cheese from Lombardia which is not strictly considered a cheese but a latticino. It is in some ways more similar to butter or Ricotta. Buy: Mascarpone should have a delicate flavour, extremely dense and creamy texture, and should be pure white. The fat content varies from 20 to 45% but ideally purchase Mascarpone at the top end of this range. It has a mild, creamy flavour which can become slightly sour after a few days. Store: Store in the refrigerator and use by the indicated date on the package. 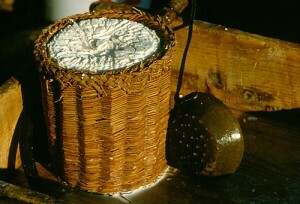 Mascarpone can be stored for 20 to 30 days after production. Prepare: None needed but if you need to whip it for a pudding, it is more pliable if removed from the refrigerator an hour beforehand. If the cheese has moulded then discard it. Eat: Mascarpone is used in many desserts, most famously in tiramisù. It pairs well with fruit and sugar. It is also used in savoury preparations in Lombardy such as with pasta or can be layered with Gorgonzola dolce cheese and garnished with nuts. It can also be eaten on its own sprinkled with sugar and cocoa. Mozzarella di bufala by Jen R.
Strictly speaking, the word “mozzarella” means curd cheese made from buffalo milk (sometimes referred to as Mozzarella di bufala). Most places around the world, the word “mozzarella” refers to Fior di latte, a curd cheese made from cow’s milk. They are similar in texture although buffallo milk mozzarella is creamier and softer with a more intense flavour. Mozzarella has been produced in Campania since the 13th century. The name “mozzarella” comes from the verb “mozzare” which means “to cut” referring to the cheese-making process it undergoes when the curd is cut to the desired size. Buy: Mozzarella can be formed in to tiny or large balls, ovals, or braids. The weight of each individual Mozzarella can range from 30 to 600 grams. The outside should be smooth and shiny with a thin skin and the colour of white porcelain. The fat content should be a minimum of 50% and it should be mildly stretchy. 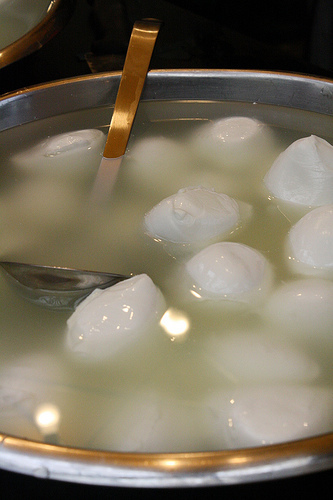 Good Mozzarella is typically sold in liquid to maintain its freshness. The taste should be mildly salty and when cut open, cream should come out from the cheese. 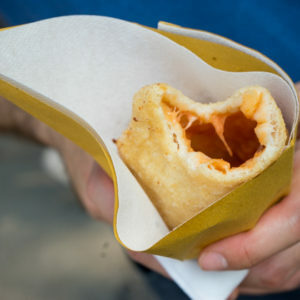 There are also smoked Mozzarellas which have been smoked in straw, wood, or leaves. Store: Store covered in its own liquid in the refrigerator for up to 48 hours but ideally use as soon as possible. Prepare: If the cheese has moulded, then discard it. Normally you can just remove the mozzarella for the liquid and tear it by hand to use in dishes. For dishes such as pizza, calzone, and aubergine Parmesan you may want to strain the Mozzarella after breaking it up to remove excess liquid. If eaten raw, it is best enjoyed at 15 to 18˚C. 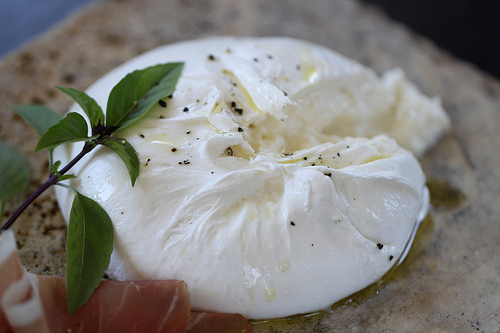 Eat: Mozzarella pairs well with tomatoes, herbs, olives, peppers, and olive oil. Mozzarella can be eaten raw in salads such as caprese or cooked in dishes such as mozzarella in carrozza, mozzarella impanata, pizza, calzone, and parmigiana di melanzane. Parmesan is a term used around the world for cheese in the style of Parmigiano-Reggiano. Parmigiano-Reggiano is from Emilia-Romagna and Lombardia. It is made from whole and partially-skimmed cow’s milk cheese and is one of the most famous cheeses in the world. It has a protected origin and can only be produced in the provinces of Parma, Reggio Emilia, Modena, the left bank of the river Reno in the province of Bologna, and the right bank of the river Po in the province of Mantua. To see how Parmigiano-Reggiano cheese is made click here. Parmigiano-Reggiano has one of the highest quantities of calcium of any food and is often eaten by nursing mothers and children in Italy. It is also a good source of protein, potassium, magnesium, zinc, and vitamins A and B. This has been aged for 12 to 18 months. This has been aged from 18 to 24 months. This has been aged from 24 to 36 months. 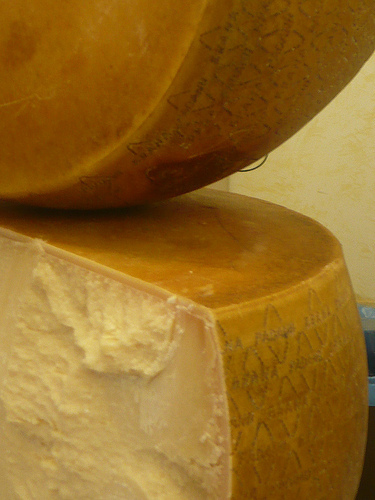 Parmigiano-Reggiano can be successfully aged for several years. Prepare: Remove the cheese half an hour before serving, unwrap it and allow it to breathe before serving. If you are grating it, cut off the rind and reserve in the freezer to add depth of flavour to soups. If the cheese has moulded, cut off the mouldy parts and discard them. Use the rest of the cheese as normal. 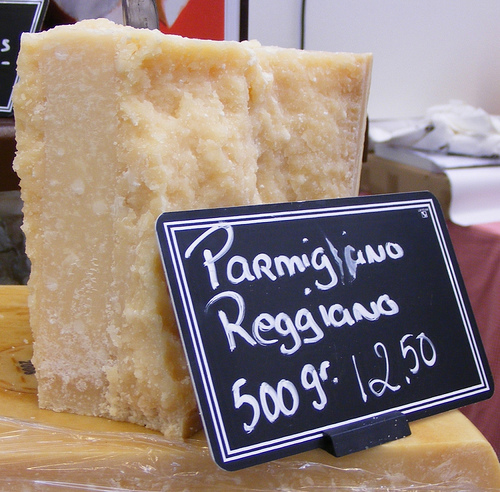 Parmigiano-Reggiano can be shaved, grated, or broken into chunks. Eat: Parmigiano-Reggiano can be eaten on its own but is often used to dress pasta, grains, risotto, and soups (unless fish or seafood is added). It is also cooked with vegetables and meat. Buy: Pecorino is an ewe’s milk cheese (pecorino means small sheep) produced in Veneto, Liguria, Emilia Romagna, Toscana, Umbria, Abruzzo, Lazio, Campania, le Marche, Basilicata, Calabria, Sicilia, and Sardegna. Pecorino is a firm, dry, granular cheese which is white or straw yellow in colour and flakes easily. It has a sharp flavour. 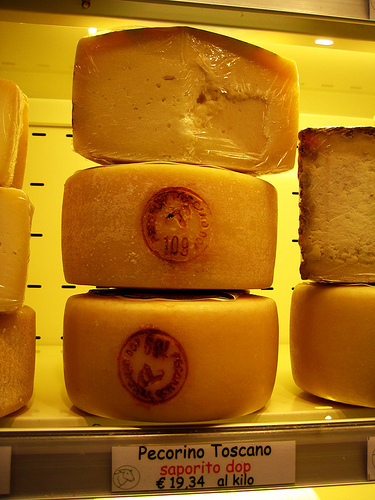 There are many types of pecorino but the ones most commonly found abroad are pecorino romano and pecorino sardo. It has a dry crumbly texture and is more often used in southern Italy in place of Parmigiano-Reggiano (Parmesan) or Grana Padano. 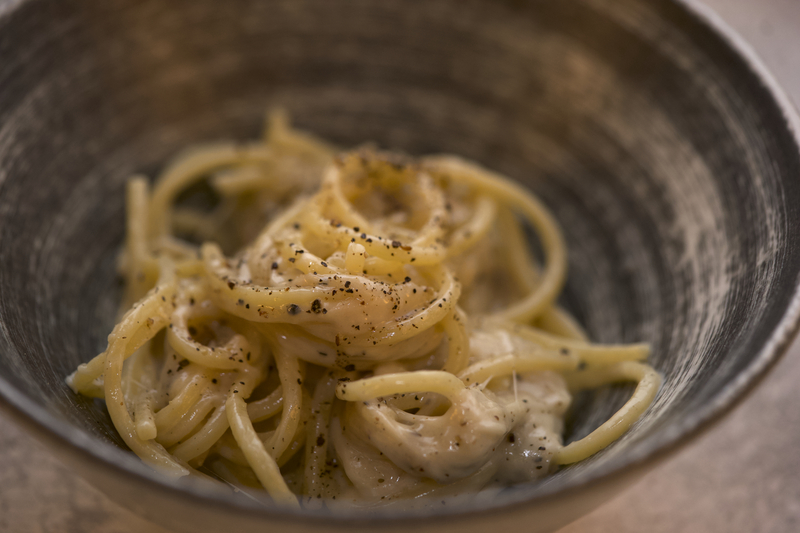 The flavour varies from mild to quite peppery and you can buy pecorino with black peppercorns inside. Some people do not like the flavour of pecorino so substitute Parmigiano-Reggiano or Grana Padano instead. 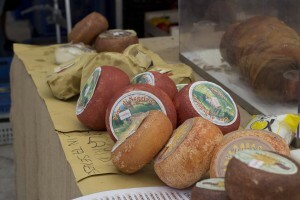 Pecorino can be sold fresh (with a soft and elastic texture), primosale (salted with a medium firm texture), mature (firm and grainy in texture), or smoked. The fresh and salted versions tend to be eaten as a table cheese. Prepare: Remove the cheese half an hour before serving, unwrap it and allow it to breathe before serving. If the cheese has become mouldy, cut off the mouldy parts and discard them. Use the rest of the cheese as normal. Pecorino Romano is a hard ewe’s milk cheese from Lazio, Toscana, or Sardinia. Pecorino Romano is protected in origin and can only be produced in the Agro Romano area, the province of Grosseto, and in Sardegna. Buy: Pecorino Romano has a black plastic film on its rind, although Pecorino Romano made for domestic consumption may not have the black film. It is typically aged for 5 months for table eating and for 8 months for grating. Pecorino Sardo is hard ewe’s milk cheese from Sardegna. The fresh and primosale versions of Pecorino Sardo are served as a table cheese, classically paired with tender, young raw broad beans. Buy: Pecorino Sardo is made from whole ewe’s milk and can be purchased fresh (20 to 60 days maturity) or mature (aged 2 to 12 months). 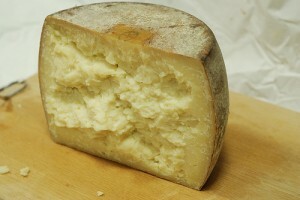 The mature pecorino sardo may also be smoked. Fresh Pecorino Sardo has a smooth, thin, white coloured rind with a soft, elastic, white, firm textured cheese inside. The flavour is mild and slightly acidic. Mature Pecorino Sardo has a thick, straw yellow to brown rind depending on the age. The cheese inside should be firm, grainy, hard, white to straw white in colour, and have a few holes (eyes). The flavour is slightly tangy. Pecorino Siciliano is an ancient Sicilian cheese enjoyed even by the ancient Greeks. It is a hard cheese made from whole raw ewe’s milk. It is produced from October to June. Buy: Pecorino Siciliano can be eaten fresh (in which case it is called Tuma), after salting (then called Pecorino Primo Sale), semi-mature after being aged for 50 days, and mature after being aged for a minimum of 4 months (only the mature bears the DOP label). The mature cheese is used for grating. The rind is pale yellow in colour and impressed with the markings of the basket it was made in. The inside is compact, white or straw yellow colour, and has a sharp flavour. Sometimes there are black peppercorns studding the cheese. 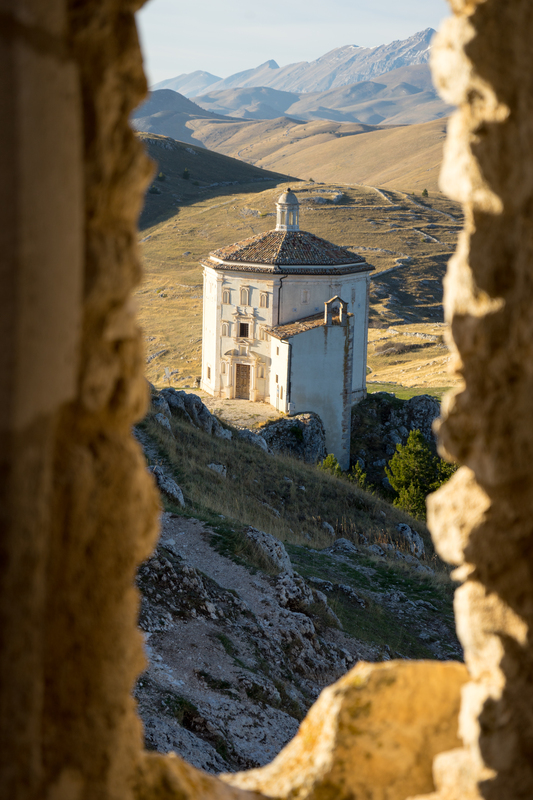 The mature Pecorino Siciliano DOP is used for cooking and is used in dishes such as gnocchetti (potato dumplings), maccheroni al sugo (macaroni with meat sauce), and bucatini alla contadina (bucatini pasta with vegetables, legumes, meat, and potatoes). Pecorino Toscano DOP is a hard ewe’s milk cheese from Toscana, Umbria, or Lazio. 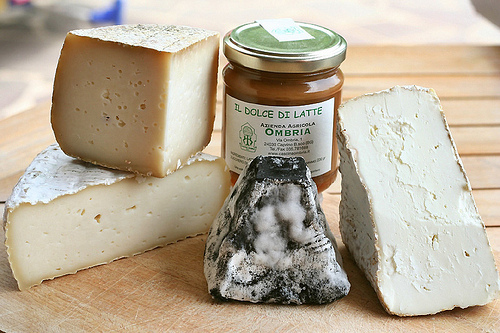 Buy: Pecorino Toscano DOP can be made with pasteurised or raw ewe’s milk cheese. It is slightly sweeter in flavour than other pecorinos. The outer rind is yellow in colour and the inside is a straw yellow colour which is firm in texture. It is sold soft which has been matured for 20 days or semi-hard which has been matured a minimum of 4 months. Maturities in excess of 8 months can also be used for grating. This is a fresh cheese made from goat’s, ewe’s, cow’s, or mixed milk in Liguria, Emilia Romagna, Toscana, Umbria, Apulia, and Calabria. 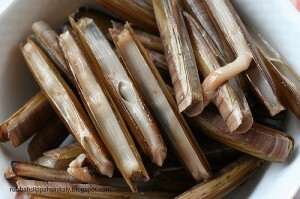 In Calabria there is also a smoked matured version of Giuncata which is used to grate over rice or pasta or in recipes. It is made in rush baskets or wrapped in ferns. Buy: The cheese has a buttery texture, and has a delicate and sweet flavour which tastes like milk and hazelnuts. Store: This cheese will only keep 4 days from production so eat immediately after purchasing or store wrapped in the refrigerator until you can eat it. Prepare: Remove from the packaging and use. If the cheese has started to mould, then discard it. Eat: As this cheese is very delicate, do not pair it with strongly flavoured foods. It is used in pasta dishes. Ricotta is not actually a real cheese but is considered a “latticino”. It is very easy to make from good, whole milk. Please see the recipe in the Basics section in Recipes to learn how to make this at home. Ricotta means re-cooked (from recoctus in Latin) and refers to the whey left over from cheese making which is reheated to separate out the proteins which are strained out and formed into ricotta. Ricotta is used all over Italy but particularly in Piemonte, Veneto, Valle d’Aosta, Friuli Venezia Giulia, Calabria, Abruzzo, Puglia, Basilicata, and Sardegna. In Calabria there is also a ricotta which is mixed with pecorino cheese and baked, sometimes it is also smoked and salted. Buy: Ricotta is typically a fresh cheese made from cow’s, ewe’s, or goat’s milk whey. It can also be eaten after salting or dry-salted and matured for 15 to 30 days (ricotta salata). The dry salted version may also be smoked and is then called “ricotta affumicata” and may be aged for a week to a month. The best ricotta is unsurprisingly made from the best milk and is eaten as fresh as possible. The finest ricotta is considered to be that from Piemonte and ricotta romana. 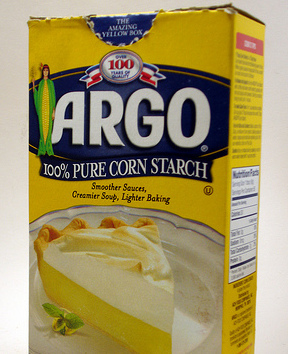 It can be made very creamy or skim fat. Store: Cheese will continue to mature after you take it home. Fresh ricotta should be left in its packaging in the refrigerator and eaten as soon as purchased. Matured ricotta should be wrapped individually in cling film, parchment paper, or tin foil and placed in the drawer of the refrigerator. Prepare: Fresh ricotta is simple to make at home using only whole milk and lemons. See the recipe section under “ricotta” for details. Fresh ricotta may need to be strained before eating, depending on the recipe. Remove the mature ricotta half an hour before serving, unwrap it and allow it to breathe before serving. If the ricotta has started to mould this may or may not be an issue. If the ricotta is fresh and it was industrially produced in a sealed plastic container and it develops mould then discard it. If you buy ricotta in a basket and the top has a bit of mould, scrape away the top 1cm and taste a bit of the ricotta underneath, if it tastes sweet (it will have the characteristic flavour of the milk it was made with be it buffalo’s, ewe’s, or cow’s milk), then go ahead and use it. If it is a hard cheese, then cut off the mouldy parts and discard them, use the rest of the cheese as normal. Eat: Ricotta pairs well with honey, cinnamon, chocolate, spinach, chard, Parmigiano-Reggiano cheese, tomatoes, and cucumbers. Fresh ricotta can be eaten on its own but is typically used in pastas, stuffed pasta (tortellini), savoury pies (torta verde and torta rustica di ricotta), fritters (ricotta fritta), calzone, polenta, and desserts such as cakes (torta di ricotta), puddings (budino di ricotta), pastries (sfogliatella), and tarts. Dry mature ricotta (ricotta salata) can be used as a table cheese, grating, or as an ingredient in pastas, salads, and desserts. This is a fresh “latticino” from Romagna. Buy: Squaquarone is made year-round from pasteurised cow’s milk. It has a delicate sweet flavour and creamy texture. It is fairly liquid and cream white in colour. Store: Use immediately after purchasing. Store in the refrigerator in its packaging for a day. Prepare: Remove from the packaging and use. If the cheese has moulded, then discard it. Eat: Used to spread on piadina, focaccia, and flat rolls. 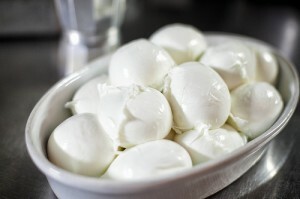 Stracchino derives its name from the word “stracca” which means “to be tired” in Lombardian dialect. The name refers either to the cows being tired from migrating during the autumn or to their milk being tired. Buy: Stracchino is made from raw cow’s milk and can be sold fresh or briefly matured. It has a buttery texture, is white or pale yellow in colour, and has a sweet flavour. Store: Cheese will continue to mature after you take it home. 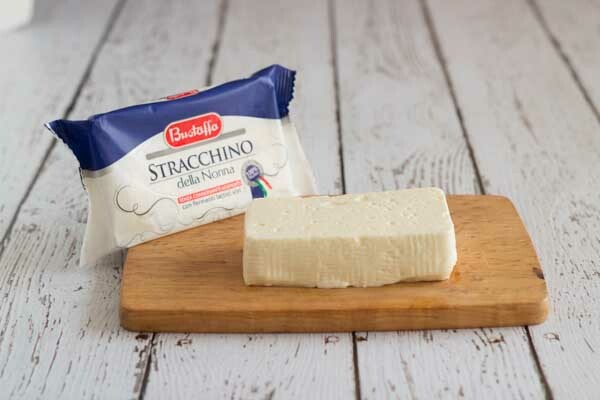 Fresh stracchino should be left in its packaging in the refrigerator and eaten as soon as purchased. Briefly matured stracchino should be wrapped individually in cling film, parchment paper, or tin foil and placed in the drawer of the refrigerator. Prepare: Remove the cheese half an hour before serving, unwrap it and allow it to breathe before serving. If the cheese has moulded, then discard it. Eat: Stracchino is a great table cheese but can also be used in sandwiches and in focaccia (focaccia di Recco). 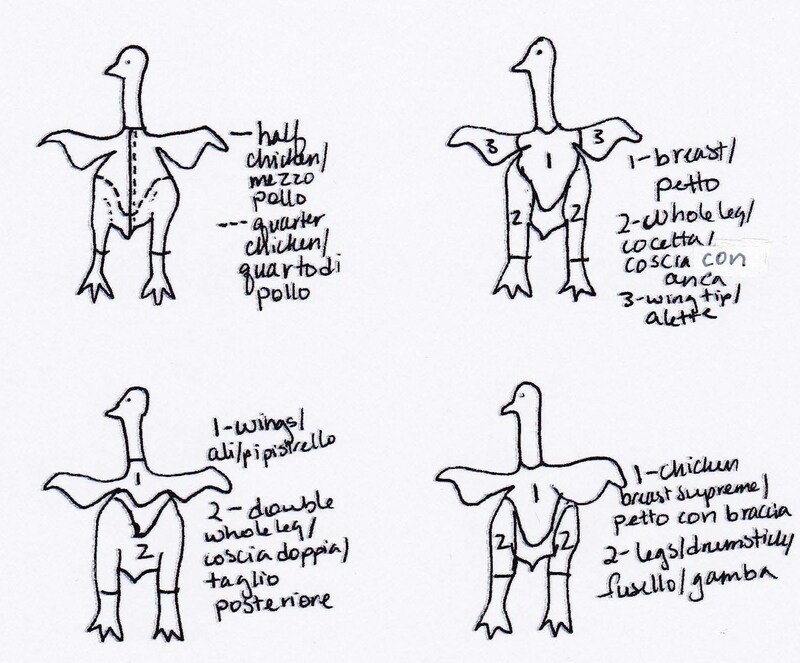 Both female (gallina) and male (gallo) chickens are used in Italy but the female is more common. 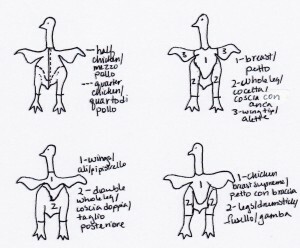 Traditional varieties in Italy include: Razza gigante nera d’Italia from Liguria, Pollo combattente di corte padovana and Rustichello della Pedemontana from Veneto, Pollo della razza fidentina and Pollo della razza romagnola from Emilia Romagna, and Pollo del Valdarno from Toscana. Capon (Galetto) is male and about 6 months old. Gallo is a male which is two years old and is tough to eat. Gallina is female which is old and is only good for its fat and for making soup. The best category is the broiler chicken. Chicken should have firm, elastic meat. The skin should not be sweaty or sticky. The breast bone and the weight will tell you the age of the chicken. The lower part of the breast bone should be flexible and the rest of it rigid, indicating a relatively young chicken. There should be a reasonable amount of fat that is uniformly distributed. 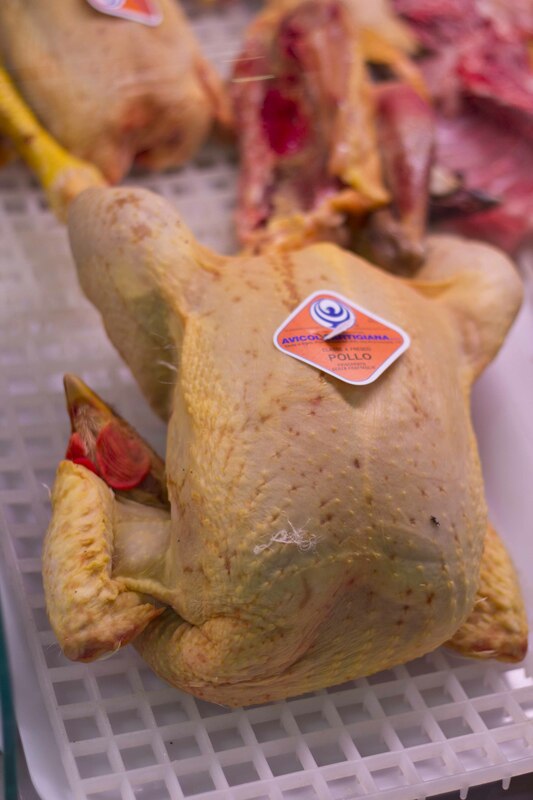 The best chicken is free-range as it will have been allowed to exercise so that the flavour of the meat develops. Frozen chicken will have less flavour than fresh chicken. Check to ensure the chicken does not have freezer burn or chunks of ice, indicating the chicken has been defrosted and then re-frozen. Store: Chicken can be stored wrapped, in a container to contain any juices on the bottom shelf of the refrigerator at 5˚C for 1 to 2 days. If your time requirement is longer than this then the chicken can be frozen at -18˚C and then thawed when needed. Cuts of chicken can be stored, well-sealed in thick freezer bags, in the freezer for up to 9 months and whole chicken for up to 1 year. If the meat begins to show signs of grey, white or brown patches on the meat, it is developing freezer burn and is dehydrating. It is still edible but will be dry and not taste nice. Prepare: Chicken can carry salmonella bacteria so chicken must be handled carefully and every surface raw chicken has touched should be washed thoroughly with soap. Never touch raw chicken and then cooked food. Never cut anything which will not be cooked on a cutting board where raw chicken has been handled. Never use the same tray which held raw chicken to then hold the cooked chicken without thoroughly cleaning it first. Frozen chicken should be thawed in the refrigerator. If time does not permit, soak the sealed frozen chicken in cold water, changing the water as the water temperature gets too cold. Keep repeating until the chicken thaws. Never soak a frozen chicken in warm water as this promotes bacterial gowth. Chicken can be eaten whole or cut into various cuts (see above). Eat: Chicken should be cooked to 75˚C (170˚F) to ensure all the bacteria is killed. I normally cook mine to 65˚C as it is juicier. Remember to remove the chicken from the heat at 72˚C as it will continue to cook after it has been removed from the heat. Chicken can be boiled (better for older chickens), grilled (pollo alla griglia or pollo alla diavola), stuffed, stewed (pollo alla cacciatora), spit-roasted, pan-fried (pollo in padella alla romana, pollo alla Marengo, or pollo alla salvia), and roasted (pollo arrosto or pollo al mattone). Chicory is a category of vegetable that has many varieties which are completely distinct in appearance. Chicory can be white, green, red, or mottled red and white. It can be wild or cultivated. Chicory is a class of bitter lettuce that includes endive, escarole, and different types of radicchio. 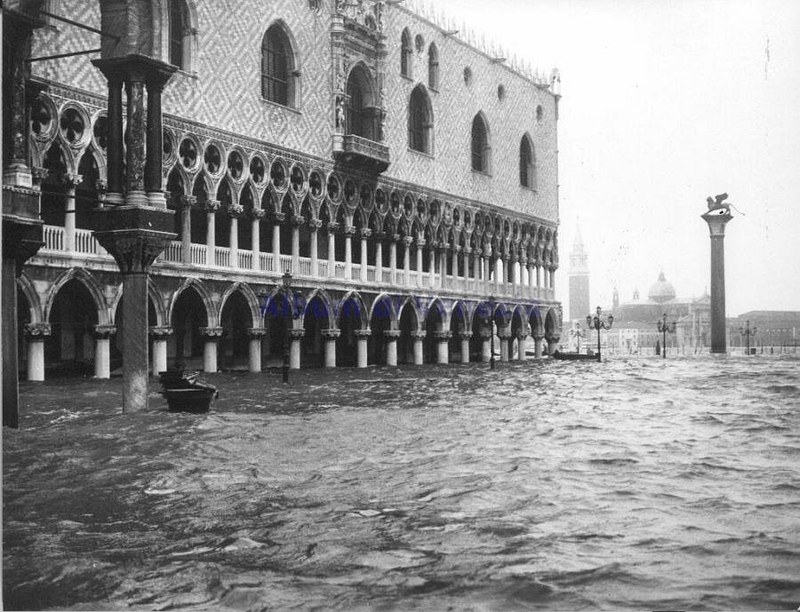 The most famous chicory comes from Treviso where there is a consortium to protect the geographic communities where they are grown. They have been used since ancient times in Europe in tonics and they are known to have a purifying and diuretic effect. Chicory is typically harvested from December through March, but there are also some summer varieties. Buy: See the individual varieties below on how to purchase. In general young chicory is better for eating raw and the more mature chicory is best cooked. Store: Chicory can be stored in a plastic bag in the drawer of the fridge for 2 to 3 days, 1 week maximum. If it starts to wilt, you can stand the stem end in water. Prepare: Discard the external leaves and any damaged leaves, snap the leaves off from the base and discard the base, wash thoroughly in cold water, cut, if using raw, then soak in very cold water, and dry. Cut just before using as they discolour. They are best thinly cut. Internal leave are sometimes hard. They can be blanched in boiling water with a bit of lemon juice to reduce their bitter flavour. Eat: These vegetables are excellent to eat as their bitterness offsets the fat in some dishes. Young chicory are great in salads. 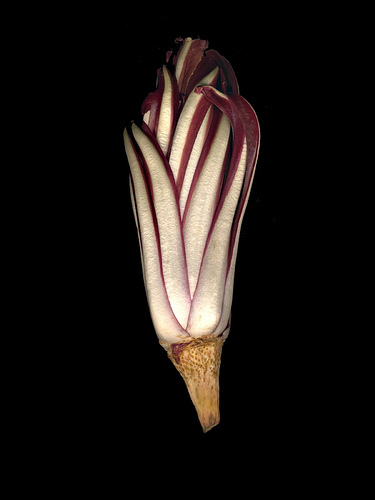 The mature chicory can be roasted, grilled, seared, boiled, sautéed, braised, steamed, used in risottos, soups, preserved, used in pastas, and even used as a substitute for coffee. Chicory pairs well with olive oil, cream, butter, chilli, vinegar, lemon, garlic, anchovy, and Parmigiano-Reggiano cheese. This variety of chicory grows with long, thin, jagged, upward pointed green leaves. It grows to between 15 to 50 cm in length. Its season is from November to April. Buy: The leaves should be a healthy green colour and unblemished. The ribs should be firm and plump. Prepare: Cut the base of the stalk of the catalogna, reserving the heart to finely slice. Remove and throw away any damaged leaves or hard parts. Remove the stalks and leaves and thinly slice using a knife or a puntarelle cutter. Wash well in cold water and soak in ice water until the leaves curl (about 30 minutes). For an illustrated step-by-step guide, see here. Drain the leaves, dry and prepare according to the recipe. Eat: They can be eaten raw or cooked. They are generally used in salads, as an accompaniment to roasted meat or fish, or sautéed with white meat. They are great raw in pinzimonio or are boiled and simply dressed with olive oil and lemon juice. Puntarelle are dressed with olive oil, anchovy, garlic, and lemon juice or vinegar and eaten raw. It also features in cicoria in brodo (boiled chicory sautéed with lard and ham, cooked in broth, and served with grated pecorino cheese). 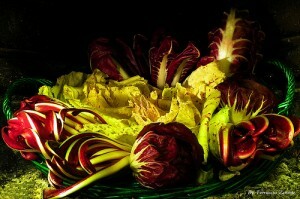 There are many types of radicchio but many tend to be labour and cost intensive to cultivate. Many of the varieties are deprived of light during the latter part of their cultivation. They are available from December to April. Green radicchio is rich in vitamin A. Buy: Buy leaves which are brightly coloured and don’t have any dark marks on the leaves. 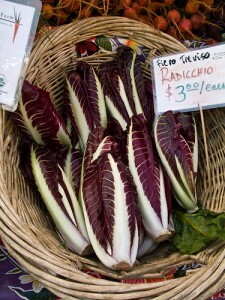 The red radicchio varieties are more fragile so you need to be more careful when you buy them. They can have round or oblong head with firm leaves and white ribs. Prepare: Cut in half compact heads of radicchio like Chiogga, tear the leaves and wash thoroughly in cold water. Green chicory which grows as a head should have the leaves peeled and washed. For radicchio di Treviso, use a knife to cut in half lengthwise and cut into slices, held together by the root (which has been peeled). 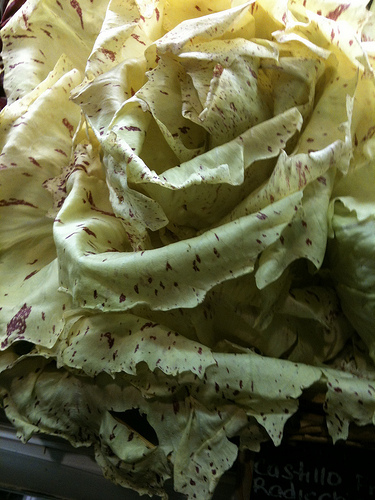 For radicchio varieties which grow as a head, the root is also eaten after being peeled and cleaned. The root is the healthiest part of the vegetable. 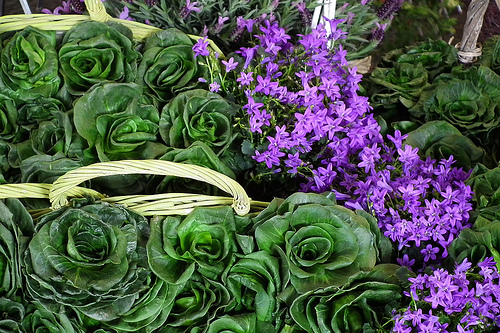 Eat: Green radicchio should only be eaten raw. The red radicchio can be eaten cooked or raw. Radicchio can be grilled, sautéed, baked, or braised. Radicchio di Treviso, both the elongated version and the curl tipped variety when served raw are typically served whole with vinegar and olive oil. Radicchio can be grilled, braised, broiled, roasted, sautéed, or stuffed. Radicchio is used in salads, risotto, sauces, as an accompaniment to meat and fish (radicio fumegà, radicchio in soar, and radicchio e lardo), or grilled and served as a starter or as an accompaniment to grilled meat. Endive is in season from September through November. Buy: Look at the leaf colour to ensure the leaves are not withering with brown and yellow marks and that the tips are not turning green. The heart of the Belgian endive becomes more bitter with time so it is vital to ensure you select young ones. If you are unlucky, you can always blanch them quickly in boiling water to remove the bitterness. The more white in colour, the less bitter in flavour. Prepare: Peel the leaves off and wash in cold water. Eat: It can be eaten raw as whole leaves or chopped. Because of its bitterness it pairs well with fattier dishes like fresh cheese. Endive can also be boiled and served with melted butter, caramelised, or served gratinée with butter and cheese. It can also be stuffed (aliciotti con indivia). 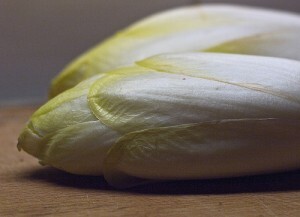 Belgian endive can be served raw, grilled, roasted, or braised. Curly endive tend to be eaten raw in salads. There are many varieties of escarole but most have curly leaves. They are covered during their cultivation to ensure the heart is white and therefore tender. They contain Vitamin A, and calcium. Buy: They should have unblemished crinkle-edged green leaves with a white centre. The leaves should appear fresh. Store: Escarole perish easily so are best eaten when purchased. Prepare: Wash, peel the leaves (throw away any damaged ones), dry, and break into strips. Eat: They are eaten raw, boiled, stewed, steamed, stuffed (scarola ‘mbuttunata), in soup (minestra di scarole e ceci neri, zuppa di scarole e spollichini, and minestra di scarola), or braised. They can also be eaten on pizza, such as in pizza di scarola. Chillies can be round or an elongated conical shape. Italians in general, outside of Basilicata, Calabria and Abruzzo, do not eat much chilli or spicy food. Chillies range in size from 30cm to 5 mm and in spiciness. Chillies are in season from July until September. Buy: Chillies can be purchased fresh, dry, infused in oil (olio santo or olio al pepperoncino), crushed into flakes, or ground into a powder. They come in a variety of colours such as green, red, yellow, purple, and brown. The green chillies can be either sweet or spicy while the red are always spicy. 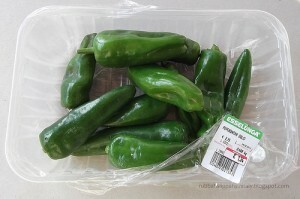 The round chillies are medium spicy while the small conical chillies 1-2cm in length are spicy. Select fresh chillies which are brightly coloured, firm, shiny, and blemish free. They should have a firm stem and be unwrinkled. For dried or powdered chillies (pepperoncino in polvere), check to ensure they have a strong smell, are red (not brown), and appear to be pest free. Store: Wrap the chillies in paper towels and keep in the drawer of the refrigerator for up to 3 weeks. Prepare: When working with fresh chillies, you must be careful not to burn yourself as the oil in the chillies can burn your skin and your eyes. For this reason it is best to wear gloves and ensure not to touch your eyes, mouth, or nose. Always rinse chillies in cold, not hot water. Be sure to wash your hands immediately afterwards. To cut a chilli, cut the stem off, slit the chilli lengthwise, and scrape out the white ribs and seeds before chopping. To make the chilli less spicy, remove the ribs and the seeds, and rinse it in cold water after it has been prepared for chopping. To make it more spicy, add the seeds. When cooking with dried chilli or chilli flakes, adding the chilli when frying in oil will make the dish spicier, adding it later on in the cooking to the liquid will make it less spicy. Eat: Chillies are used in stews, pastas (pasta all’arrabiata and spaghetti con le vongole), sauces, fish, seafood, sausages, and in salami. Dishes with the name “all’arrabiata” imply that there is chilli in the dish. 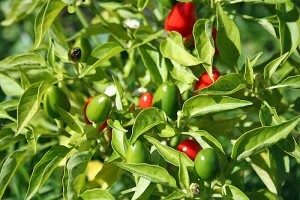 Many recipes from Abruzzo or Calabria use chilli. Chilli is also used, albeit less frequently, in Basilicata, Campania, and Puglia. Chocolate is a combination of cocoa (minimum 35%) and sugar mixed together with any of the following: cocoa butter, milk, honey, and flavourings. Chocolate came from Central and South America where it was enjoyed as a drink. Turin chocolatiers obtained their first license to sell chocolate as early as 1678 and the Swiss learned the art of making chocolate from the Torinese when Turin was the European centre for the art of chocolate making. Buy: The production method of the chocolate can vary widely and typically corresponds with the price as there are true artisans making a rare product. Milk chocolate is more popular while true chocolate aficionados prefer dark chocolate. Never buy anything labelled “chocolate flavour” as it is not real chocolate. Dark chocolate/Bittersweet chocolate (cioccolato fondente): Dark chocolate comes in varying percentages of cocoa content with the higher the percentage the more bitter and less sweet the chocolate. 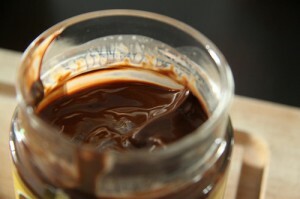 This type of chocolate with at least 43% cocoa but preferably 60 to 70% (cioccolato extrafondente) is best for cooking. It has about 26-28% cocoa butter and not more than 57% sugar. Chocolate (cioccolato): Chocolate has at least 35% cocoa, 18% cocoa butter, and sugar. 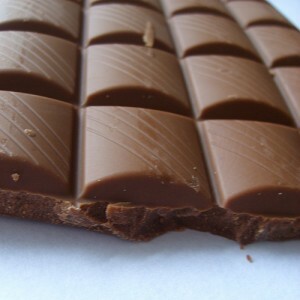 Milk chocolate/Plain chocolate (cioccolato al latte): Milk chocolate is typically creamy and sweet with a mild flavour. Milk chocolate is better for icing as the higher fat content means it melts better and dries with a sheen. This type of chocolate has at least 25% cocoa, 14% milk, vanilla and no more than 55% sugar. White chocolate (cioccolato bianco): Strictly speaking, white chocolate is not chocolate as it is made from cocoa butter and not cocoa. 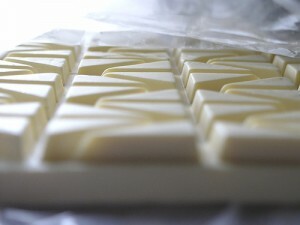 White chocolate is best for eating and not for cooking. White chocolate has at least 30% cocoa butter, milk, vanilla, and no more than 55% sugar. Chocolate fondant (Gianduia): This is chocolate mixed with other ingredients like vanilla, milk powder, nuts, fruit, etc. Gianduia is a chocolate fondant mixed with toasted hazelnuts and vanilla invented in Turin in 1852. Covering chocolate (cioccolato della copertura): This is chocolate with additional cocoa butter added to make it more fluid and easier to use to make as a coating for chocolates and desserts. Store: Chocolate should be stored in a cool (ideally 18 to 20˚C), dry place that is well ventilated. If it is too warm, the chocolate will melt while if it is too cold (for example, in the refrigerator) it will bloom and appear whitish on the outside which is the cocoa butter separating and recrystallising on the surface. Rapid temperature changes and too much humidity (ideal is 55%) will cause the sugar or fat in the chocolate to separate. When there is bloom, the chocolate is still edible but will not look nice. It can be stored for up to 6 months. Prepare: If the chocolate is to be melted, it is best melted in a bain-marie so that it does not scorch. Be sure that no steam or condensation gets into the chocolate or the chocolate will seize up. When baking cakes, biscuits, and pastries containing chocolate, it is best to reduce the oven’s temperature to ensure they don’t scorch. For grating chocolate, it is best to refrigerate it beforehand so that it doesn’t melt while grating. Eat: Chocolate is typically used in desserts such as gelato, creams, custards, puddings (zuppa inglese), cakes (torta al cioccolato and torta al cioccolato con nocciole), pastries (profiteroles and eclairs), semifreddo, etc. 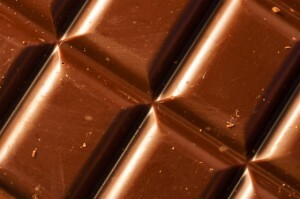 Grated dark chocolate is also used in savoury dishes such as caponata, salmiì coda alla vaccinara, and cinghiale in agrodolce. Ciccioli can either be the crispy, rendered residual pieces of leftover from the butchering of an animal, typically pork or goose, when making lard or a salami made out of the residual pieces pressed together. Buy: These are irregular pieces of meat which are hazelnut coloured. They are quite fatty. They are sometimes flavoured with bay leaf, pepper, or cinnamon. Store: The crispy pieces can be kept for a long time. Prepare: The crispy pieces are best eaten hot. The salami version is best thinly sliced. 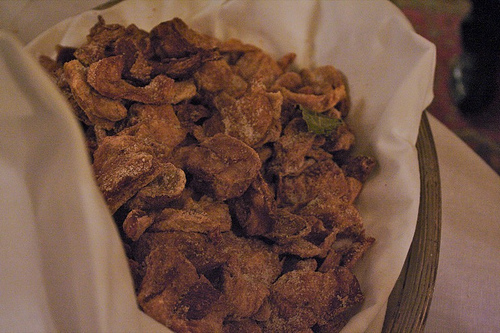 Eat: The crispy ciccioli are used in dishes in Emilia, Lazio, and Campania. Goose scratchings are eaten in Lombardia. They can be eaten on their own as a starter or with an aperitif. They can also be used in omelettes, savoury pies, in polenta (polenta e ciccioli), on focaccia and breads (pizza con ciccioli, migliaccio campano, and pane con i cicoli), or in dishes such as cicciolata di Parma. The salami ciccioli are good thinly sliced and served with tigelle. Cocoa powder is made from fermenting, drying, toasting, and grinding cocoa beans and then removing the cocoa butter. The amount of cocoa butter still contained in the cocoa powder varies by producer. Buy: Cocoa powder is sold as bitter cocoa (cacao amaro) or sweet cocoa (cacao dolce). The best quality cocoa comes from Venezuela, Ecuador (l’Arriba and Macao varieties), Mexico, Guatemala, Togo, Ivory Coast, and Nigeria. Some cocoa labelled “Dutch” undergoes a process to reduce the acid in the cocoa which makes it darker in colour and more mild in flavour. Store: Store cocoa powder in a well-sealed container in a cool, dry place. It can be stored this way for years. Prepare: If you need to add cocoa powder to a liquid, as it contains some starch, then it needs to be mixed to a paste with a bit of milk or water before the rest of the liquid is added to avoid lumps. 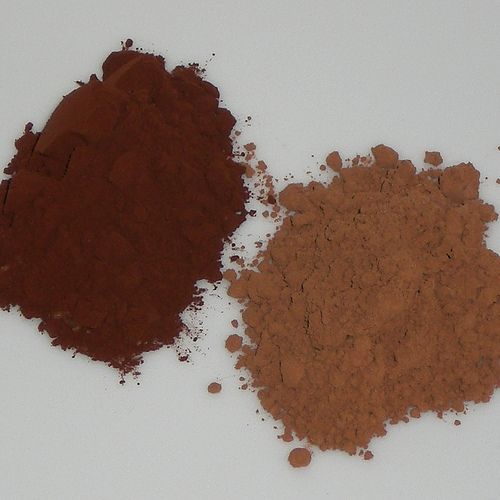 When used in baking, cocoa typically substitutes up to 15% of the flour. Eat: Cocoa powder can be mixed with milk and sugar to become drinking hot chocolate. It is also used as a flavouring in cakes, biscuits, puddings, and pastries. Coffee was introduced to Italy in the 16th century from the Arab world and it became very fashionable to drink it. Coffee has since become part of the Italian national identity and an essential daily ritual. Not until 1933 when the Moka (see Equipment section) was invented could average Italians easily make coffee at home without an expensive espresso machine. Coffee substitutes have also been invented using barley, chicory, oats, spelt, and rye. Coffee contains caffeine which is a stimulant which affects the central nervous system and brain. Espresso, while it tastes stronger than filtered coffee, actually has less caffeine. Coffee is grown in Brazil, Colombia, Jamaica, India, Venezuela, Guatemala, Costa Rica, Mexico, Indonesia, Ethiopia, and Kenya. Buy: To make espresso, buy “fine ground” or “drip ground” espresso beans which are well sealed. The best are labelled “Pure Arabica” or “100% Arabica”. Classic Italian brands of coffee include Lavazza, Melitta, and Illy. Coffee is sold as whole beans or ground, but whole beans, ground just before brewing have the best flavour. However they are more hassle and more difficult to get to the proper grind if making espresso. There is also instant coffee which comes in granules but it is vastly inferior. Coffee should be sealed in order to retain its flavour, particularly if already ground. Coffee loses its flavour easily so should be purchased within 60 days of production. Another difference between coffee and espresso is that espresso is made by using steam and pressure to filter finely ground coffee beans which have been roasted longer. Coffee is made by using water to filter through a more coarse grind of more lightly roasted coffee beans. The more the coffee beans are roasted, the lower the acidity and the less variation of aroma. So coffee can be more bitter or more acid than espresso. There are flavour variations within espresso beans as well. The preference in Italy is geographic where northerners prefer more acidic and clear coffee while southerners prefer more bitter dark coffee. 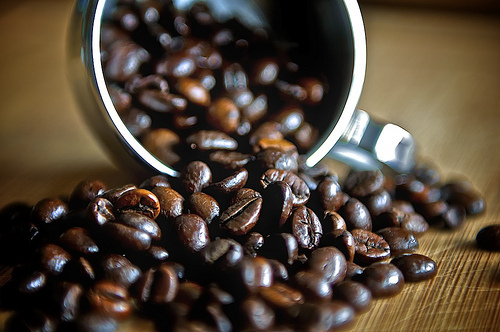 There is also decaffeinated coffee where steam is used before toasting the coffee beans to remove the caffeine. Arabica coffee: this is the most prized coffee. Look for labels which read, “100% Arabica” or “Pure Arabica”. It is more expensive and has a lower caffeine level. Arabica tend to grow at high altitudes. Robusta coffee: this is less aromatic, has a woody flavour, and has 2 to 3 times the level of caffeine to that of Arabica. Robusta tend to be grown in lower altitudes and it is easier to grow so it is more plentiful and cheaper. Very fine grind: This is one of the finest grinds for coffee and is suitable for filtering with a paper filter. Drip grind/Fine grind: This is suitable for making espresso. Medium fine grind: This is suitable for using with a caffettièra which strains the coffee grinds from the water. Regular grind/Medium grind: This grind is suitable for use with a percolator. Store: Once it has been opened, seal the coffee and use within a week. Coffee loses its flavour easily and if left unsealed will be flavourless within 2 weeks. It is best completely sealed from air and ideally kept in the freezer. Prepare: The ideal espresso is made with beans which have been ground just before using. The espresso should have foam (crema) on top which is brownish in colour, have a thick consistency, and a strong flavour. Poorly made espresso will have a weak flavour, have a white or dark crema, or have large bubbles on top. Eat: Coffee is used in dessert preparations such as gelato (gelato al caffè), semifreddo (semifreddo al caffè), cakes (torta al caffè), pastries, creams, candies, granita (granita al caffè), and tiramisu. There are also coffee drinks such as caffè alla valdostana, ponce alla livornese, and moretta marchigiana. Coffee liqueur was first created in the 19th century. 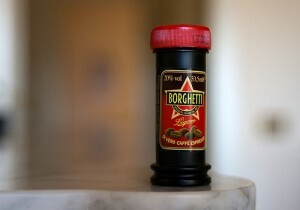 Buy: The most well-known brands are Caffè Sport Borghetti from Italy, Kahlua from Mexico, and Tia Maria from Japan. Store: By definition, liqueurs have high alcohol content which help preserve them so they can be kept for years in the cupboard. Prepare: There is no special preparation required. Eat: Drink coffee liqueur as a digestive, with a bit of cream, or in a cocktail or pour it over cream, hazelnut, or chocolate gelato to eat. 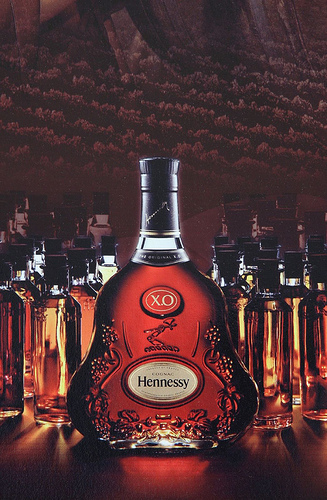 Cognac is a French brandy made from distilling wine. It has an alcohol content from 48% to 70% with a golden colour. Buy: In order for brandy to be labelled Cognac it must come from Charente or Charente-Maritime in France and be produced following particular rules. Cognacs are further classified based on the age of the youngest spirit used in the blend. Store: By definition, hard alcohol has a high alcohol content which preserves the cognac so it can be kept for years in the cupboard. Cognac does not improve with time once bottled, it only improves with age if kept in the cask. Once it is bottled, it will evaporate slowly over time. Eat: Cognac is used in many desserts and pairs well with custards, cream, butter, apricots cherries, oranges, and peaches. This is the cucurbita pepo plant, which has many varieties. Courgette is a summer squash and can be light green or dark green and elongated or round. They can also be white or yellow and even have prickly skin. Although they are best in the summer, they are available all year round. The courgettes from southern Italy and Sardegna are sweeter and lighter skinned than in the north. The most cultivated elongated green varieties in Italy are the Striata d’Italia, di Napoli, and the Verde di Milano. Tonda di Nizza is a round variety. More whiteish / yellow varieties include Bianca di Trieste, Mezzo lunga bianca, Faentina, and Bianca sarda. 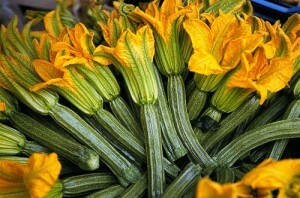 Buy: Ideally, courgettes should be picked with the flower (fiore di zucca) attached. The flower is also edible and a great delicacy, often stuffed and deep-fried. 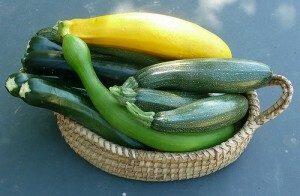 The best quality courgettes are not longer than 25 to 30cm (the round ones should not be greater than 12cm). Courgettes are a summer vegetable, best eaten early in the season so they are firm. The flesh should be firm with a glossy, bright coloured, unblemished skin. The smaller the courgette the better as the large, late season ones are watery, flavourless, bitter, spongey in texture, and have tough skins and large seeds which need to be removed. For these reasons, don’t buy courgettes which weigh more than 250 grams each. Courgette flowers should be firm, fresh, and entirely yellow or orange. They should not have any brown or soft spots and no signs of wilting. Female flowers are meatier and have better flavour than the male flowers, although the males are larger. The male flowers have only a stalk while the female flowers have a small courgette attached to them. Store: Courgettes should be stored in a perforated plastic bag in a drawer in the refrigerator. They can be kept this way for up to three days. Do not allow moisture to remain on the surface of the courgettes. The flowers are highly perishable so eat as soon as you purchase them. Prepare: Courgettes should be rinsed well in cold water. Only the prickly skin variety need to be peeled. Remove the ends and, if the courgette has large seeds, then remove the seeds with a melon baller or a spoon. Some people like to salt the courgettes before cooking to remove excess water and concentrate the flavour. 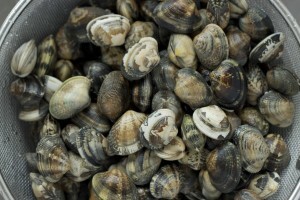 To do this, toss them with salt and let to drain in a colander in a sink for half an hour, then rinse, and squeeze dry. To prepare courgette flowers, rinse and dry them. Use your fingers or a paring knife to open the petals. You do not need to remove the pistil and stamen unless you prefer. Eat: They can be eaten raw, finely sliced in a salad, or cooked, but should be eaten immediately after cooking otherwise they will go soft. Courgettes can be preserved, made into soups (minestra alla viterbese), pastas, omelettes (frittata di zucchine), savoury tarts (torta di zucchine), or served on their own- stuffed (zucchine ripiene and zucchine alla velletrana), marinated (carpionata), stewed (zucchine alla poverella), grilled, steamed, sautéed (zucchine col guanciale), deep-fried (fritto misto), baked (zucchine al forno), or fried (zucchine a funghetto, zucchine a scapece, zucchine fritte or zucchine in agrodolce). The flowers are also eaten- usually stuffed and fried (sciurilli), baked, sautéed, in risotto, or in omelettes. Courgettes pair well with aubergine, basil, butter, chilli, garlic, goat cheese, lemon, marjoram, mint, olive oil, Parmigiano-Reggiano cheese, parsley, peppers, pine nuts, and tomatoes. Buy: Buy only very fresh seafood. Buy crabs whose shells are intact, are not missing legs, and feel heavy for their size. 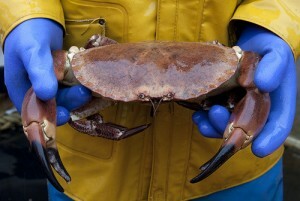 Smell the crabs, if they smell fishy or like ammonia then don’t buy. They should smell fresh and sweet. Soft shell crabs should always be purchased live. Males have a triangular abdomen while females have an oval abdomen. 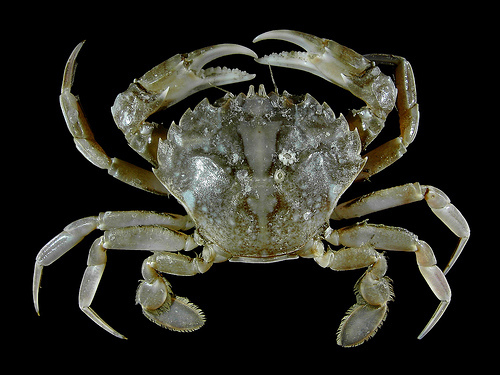 Edible crab / Brown crab (Granciporro) (Cancer pagarus) is large, about 30cm and is found in lagoons around Venice and in the Mediterranean Sea. It is hazelnut to light yellow in colour with large claws. It should have a slightly raised tail under the body. It is fished year-round. Spider crab (Grancevola / Granseola) (Maja squinado) can be up to 20cm long with long legs and a rounded body in a pear shape with spines. They are found in the Mediterranean Sea and the Atlantic Ocean. Females are smaller but have more meat while males are bigger but have less meat, although their meat is more delicate. The females are distinguishable as their underbelly is round whereas in the males it is triangular and elongated. 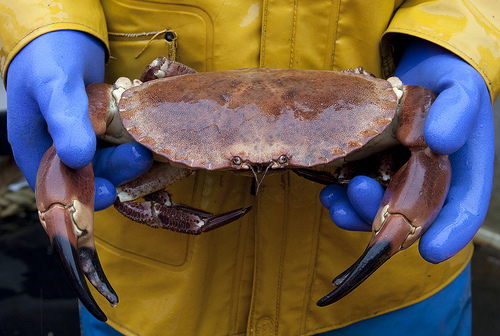 These crabs are meatiest between mid-December until the end of February. They are ideally purchased live. 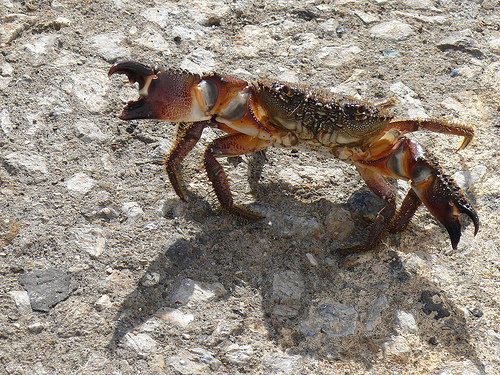 Yellow shore crab / Furry crab (Favollo) (Eriphia verrucosa) is a large, dark red-brown coloured crab with large claws, hairy legs, and spikes near the eyes. It is eaten in the winter and for most of the spring. 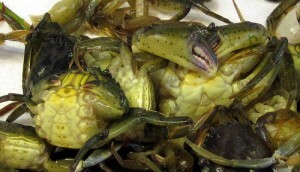 It is one of the tastiest crabs to eat. Brown crabs must be boiled in salt water or ideally court-bouillon for 20 minutes in order to shell. 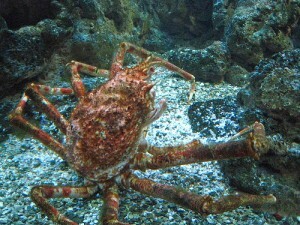 Spider crabs must be boiled first for 3-4 minutes before you can open the shell if to be used in sauces, pasta or risotto or 10-15 minutes (depending on the size) for salads. Cream is made by separating out the milk fat or butterfat from cow’s milk. Cream contains between 25 to 48% butterfat. Cream is traditionally used in the cuisine of the northern mountainous regions of Italy. Cream is not used in most parts of Italy in cooking and not typically in large quantities as it mutes the flavour of other ingredients. Buy: Cream is sweet and delicate in flavour and is used to add creaminess or fat to a dish and can be whipped to add structure and softness. Check the butterfat content and the expiry date on the packaging of the cream. The fresher the cream the better but there are many available now which have undergone ultra-high temperature processing (UHT) which preserves the cream for a long period of time although it has a flat taste. 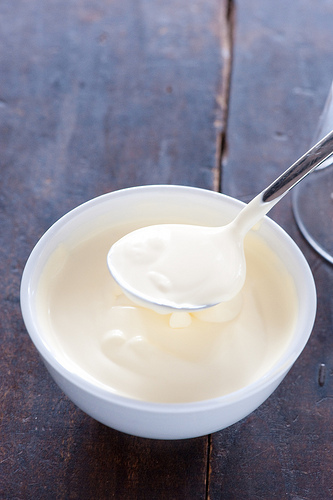 Single cream / Cream / Cooking cream (Panna da cucina) has 18-25% butterfat content and is used in cooking dishes. Whipping cream, Double cream (Panna da montare) has a fat content of 30 to 48% and is typically used for desserts. 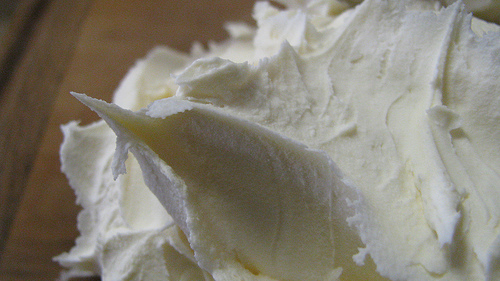 Cream needs a high fat content in order to be whipped to a great volume. Fresh cream will also whip more than pasteurized cream. UHT cream whips and holds its volume better but has a bland taste. 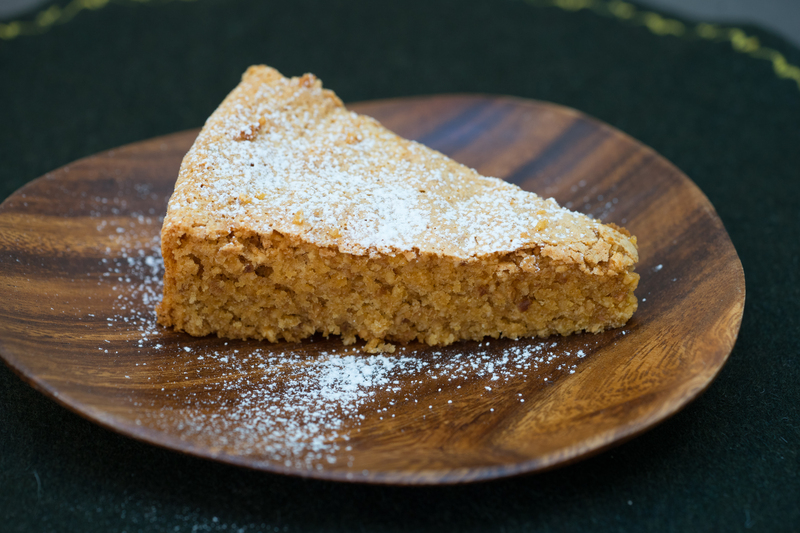 There are also clotted creams, crème fraîches, and sour creams but these are completely different and not often used in modern Italian cooking. They cannot be used as a substitute for cream. Store: Fresh cream can be kept in a closed container for 4 days in the refrigerator. For packaged cream, use the expiration date on the packaging to determine how long the cream may be kept. It needs to be kept in a cold part of the refrigerator, ideally about 4˚C. Prepare: Cream needs no specific preparation, just keep it cold until it is to be used. To make whipping cream (panna montata), the bowl, the cream, and the whisk need to be cold and then it is whipped until the cream forms soft peaks. Soft peaks are achieved when you remove your whisk from the cream and it forms a peak where the tip of the peak folds over (rather than stays straight up). Be careful not to over whip the cream or it will turn into butter. You can add sugar and vanilla to the cream if you like and the sugar will help keep the whipped cream light and not separate as easily. Eat: Whipping cream can be whipped to soft peaks, sweetened, or flavoured and served as an accompaniment to a dessert or added as an ingredient to pastas (tagliatelle con panna), puddings (panna cotta, lattemiele, and zuppa inglese), sauces, gelato, cakes, custards (crema di Cogne, fiocca, crema del Lario, and cavollat), and pastries (bongo / profiteroles). The cucumber plant has been in Italy since Roman times. They are typically grown in Campania, Puglia, and Sicilia. In Italy the cucumbers are 20 to 30cm long with a darkish green skin. There is also a rather rare white cucumber (Mezzo lungo bianco). 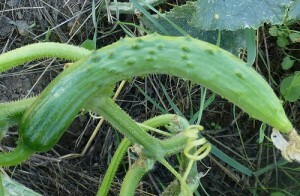 Cucumbers can be round (like the Carosello variety), elongated, or oblong with varying dimensions. They are in season from June through September. They don’t have much nutritious value with modest amounts of Vitamin C and a lot of potassium. Typical varieties include: Marketer, Pionier, Gemini, and Verde lungo d’Italia. Buy: Buy cucumbers that are medium-sized (not too big and not too small). They should be firm with no signs of mild, soft spots, wrinkling, holes, clear streaks, or brown spots. There are smooth skinned and bumpy skinned cucumbers. The short and bumpy cucumbers are good for pickling. Cucumbers can be green with or without streaks, yellow, or white. The flesh should be firm and white. This is a summer vegetable which is firm and crunchy when young and as they mature over the summer they become watery and lose their flavour. They should be sold in a cooled environment, but not frozen as this will damage them. Store: They can be kept in plastic in the refrigerator for up to a week but they start to lose their flavour. Do not let them get too cold. Prepare: Taste the cucumber, if it is bitter, then cut the ends off the cucumbers and rub the cut ends together until it begins to foam, this will sweeten it. Some supermarket cucumbers are waxed so you may need to peel the skin off. Wash thoroughly, peel, and cut the ends off. Otherwise peel according to preference particularly if the skin is thick. If you want to remove the seeds, slice in half lengthwise and use a spoon to scoop out the seeds. Sometimes cucumbers are salted to remove excess water and any bitter juices, soften the texture, and concentrate the flavour. To do this toss the cucumbers with salt in a colander in the sink and allow to rest for half an hour. Rinse the cucumbers and squeeze dry. Eat: Cucumbers are eaten raw in salads (panzanella and condiggiun), in soups (zuppa di cetrioli), marinated (cetrioli marinati), or pickled (cetriolini) for starters, sauces (salsa verde), and side dishes (to accompany vitello tonnato). 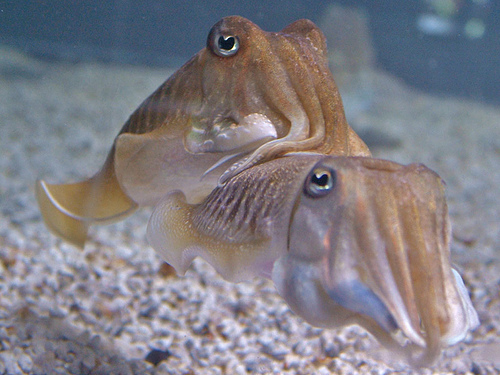 Cuttlefish is similar to squid but with a larger head and wider body. 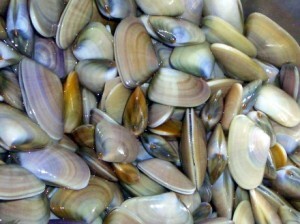 It is light brown with stripes with bright white flesh. Cuttlefish is more tender than squid or octopus. They have a very mild flavour. Buy: Cuttlefish can grow up to 25cm long and have 10 tentacles (8 long and 2 short). It is best eaten in the winter. Buy only very fresh cuttlefish if you need to use the ink as the ink changes from liquid when fresh, to grainy if it has been frozen. Otherwise frozen cuttlefish are pretty good as they don’t lose much flavour and become more tender after having been frozen. The best quality cuttlefish are the young ones as they have better flavour, are tender, and cook more quickly although the size is not necessarily an indication of age. Tiny cuttlefish are known as “seppoline”. Under 5cm are definitely young but once they are over 15cm, it is more difficult to determine the age. The dish you are preparing will determine what size cuttlefish to buy. The large ones are better for a main course dish which require long cooking times whereas the smaller ones, between 10 to 15cm in length, are better for deep-frying, grilling and in pasta. Eat: They can be stuffed, deep-fried (seppie fritte and seppioline), baked (seppie al forno), grilled (seppie ai ferri), boiled, steamed, roasted, fried, broiled or stewed (seppie alla veneziana, zimino / zemin, and seppie coi carciofi). Sometimes the baby cuttlefish are eaten raw (allievei crudi). The ink is used in pasta and risotto dishes (risotto nero), particularly in Veneto and Toscana.